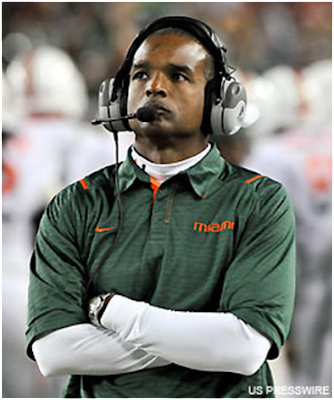 Things are looking up for Randy Shannon and Miami as they gear up for 2010, when the Hurricanes should be a top 25 team. Randy Shannon is having fun. It's March, and his Miami Hurricanes are deep into spring practice. "This is a critical time of the year," he said. "We have to get some things figured out. But we are getting closer. We are getting better." This is a big spring in Coral Gables, a spring that may serve as the opening salvo in a big season for Shannon and his Hurricanes. The brush strokes of Shannon's first three seasons have been bold and dramatic. They had to be. He inherited a listing program that was broke, a roster that had grown talent-poor. Look at Miami now. The Hurricanes will enter 2010 as a top 25 team capable of winning their first ACC title -- and their first league crown of any kind since the 2003 Big East crown -- and perhaps even contending for a national championship. "You look at our records -- 5-7, 7-6, 9-4 -- you hopefully can take that next step and get two more wins," said Shannon, who led the 'Canes to their first nine-win season since 2005 last fall. "It seems like in this conference, you have to get 11 wins to win it. We will strive for it and work for it." This spring, it's all about fine-tuning the roster. Shannon's to-do list includes shoring up an offensive line that must replace both tackles. The running back situation is a bit dicey, as Graig Cooper's status is unknown after he suffered a knee injury in the Champs Sports Bowl. And the Hurricanes are operating this spring without quarterback Jacory Harris, who is out while recovering from an injury to his throwing hand. "They used to be young guys," Shannon said. "Now they have played two years and are in their third year. From watching them develop and watching how they respond, I think they are ready to take that next step." If they don't, will Shannon be around? He has only one year left on his contract. There have been reports of Miami athletic director Kirby Hocutt and Shannon discussing a contract extension, but nothing has transpired. Hocutt didn't respond to an interview request for this article. "It would be nice if it gets done in the near future," Shannon said. Shannon was promoted from defensive coordinator and took over after Larry Coker was fired following the 2005 season. Shannon inherited a team that largely was devoid of talent. Miami had 11 players drafted in 2002, including five first-rounders. There were eight draftees -- with four first-rounders -- in 2003, and nine in 2004, with a record six going in the first round. But there have been just six first-rounders in the past five drafts and just four total picks in the past two drafts. Miami has made inroads on the recruiting trail, topped by the nation's No. 5 class in 2008. Miami has made progress in the classroom as well as on the field. Miami and Notre Dame were awarded the AFCA's Academic Achievement Award at the end of 2009 for graduating 100 percent of the eligible class of 2002 freshmen. Shannon also has operated a clean program, with only two Miami players having been arrested -- on misdemeanor charges -- since 2005. "We have worked hard and think we have things pointed in the right direction," Shannon said. Miami also has climbed back to respectability despite sub-standard facilities and the lack of an on-campus stadium. Shannon is doing his part, as he personally has raised $1.8 million for facilities. Shannon is the lowest-paid coach in the ACC, making around $900,000; he is the only one making less than $1 million a season. That Shannon has just one year left on his contract has had a negative impact on Miami's recruiting. The Hurricanes had their lowest-rated recruiting class in 2010 under Shannon, finishing fourth in the ACC. "People will always look to try and create some advantage and may have tried to use that as a talking point," Shannon said. "But my focus was on the student-athletes, connecting with them, and getting them to understand what a great family we have here, have always had in the football program, and that we are building something special that they can be a part of." Some of that building process has involved coaching changes. Shannon fired offensive coordinator Patrick Nix after the 2008 season and hired Mark Whipple off the Philadelphia Eagles' staff to run the offense. Whipple developed the Miami passing game into something to be feared. He also played a big role in developing Harris, who emerged last fall as one of the nation's most promising quarterbacks in leading Miami to victories over the likes of Oklahoma, Georgia Tech and Florida State. Miami's offense ranked fourth in the ACC (399.9 ypg) and 45th in the nation in 2009, a big step up from 2008, when the Hurricanes averaged 326.0 yards and were 89th in the nation. This season's offense should be more productive than last season's attack. The staff is excited about a talented trio of receivers in LaRon Byrd, Leonard Hankerson and Travis Benjamin. The key is finding two new starting tackles and developing young running backs such as Lamar Miller and Damien Berry. "I feel like it's my time to show the fans and my coaches what I have, so I'm just trying to come out here and compete and make myself and the team better," said Miller, who redshirted last season. "I want to improve my blocking and pass protection. In high school, we didn't do that much pass-protection because we ran the ball a lot." The defense, which is Shannon's bailiwick, returns 11 players who made at least six starts last season. Now, it's time to deliver big results. "Do I feel pressure?" Shannon asked. "All the time because it's Miami -- the pressure of winning and just the pressure of knowing what expectations are. But at Miami, you don't just have to win games, you have to win championships. "You can't win eight, nine or 10 games; you have to win it all to have any success. And the following year, you have to do it again. But it is fun." Last year, Miami saw its record 14-year streak of producing at least one first-round NFL draft choice end. And it ended with a resounding thud, as the Hurricanes had just one player selected: linebacker Spencer Adkins in the sixth round by the Atlanta Falcons. The streak began in 1995, with defensive tackle Warren Sapp being picked 12th overall by the Buccaneers. It ended with safety Kenny Phillips being chosen 31st overall in 2008 by the Giants. Most draft experts think Miami will have five or six players picked in the April draft, but none look to be first-round selections. Tight end Jimmy Graham is regarded by most as Miami's top prospect, and he played just one year after football after arriving at Miami on a basketball scholarship. Others who figure to get drafted are offensive tackle Jason Fox, linebacker Darryl Sharpton, running back Javarris James, cornerback Sam Shields and tight end Dedrick Epps. Who could be Miami's next first-round pick? It may be defensive lineman Allen Bailey, offensive lineman Orlando Franklin or quarterback Jacory Harris (if he comes out) in 2011.